Today we introduce a brand new tool for affiliates, Smart Link. We have been working on this tool for over a year now after we had multiple requests from Affiliates to build a single link that rotates between offers. It has taken the team a lot longer than initially expected to build a tool to the quality our affiliates have come to expect from us. 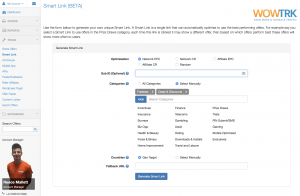 We are excited to finally bring you Smart Link, which is now live in BETA for Affiliates. Just log into your account and head to the ‘Tools’ menu on the left-hand side and then click ‘Smart Link’, to instantly create a Smart Link. What does Smart Link do? Smart Link lets you generate your own unique link that rotates across a range of offers. Each time the Smart Link is clicked a different offer may appear to the end user. Based on how you set up your Smart Link the link can optimise to show the best performing offers more often when the link is clicked. How is Smart Link different? We have spent many hours internally figuring out the best way to build our optimisation algorithm, we believe this works extremely well. We also offer a lot more flexibility than many networks, you can pick which offers to include in your Smart Link based on their category and geo-targeting settings. You can also pick what type of optimisation you want to use. Choose from 4 different optimisation methods. Geo target or manually select the country. Pick to include offers based on categories you think will perform well with your audience. Use a Sub ID to track the source. Doesn’t include offers you are not approved for. Already logged into your account? Click here to start using Smart Link now. Not yet joined WOW TRK? Open an affiliate account instantly. This tool is extremely new, whilst we have tested this internally, it will remain in BETA for the first few months. Please report any issues/bugs you may find to our team as soon as possible.